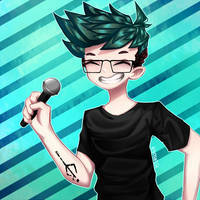 A cute little piece of Jacksepticeye and Septiceye Sam to celebrate his new drum kit and first drum cover! I loved seeing how excited and giggly he was with his new kit. I’m so happy for him. It warmed my heart to see his face just light up as he started playing. Thank you for letting us into this wonderful part of your life Jack, I can’t wait to see more of your drum covers. Aw!! This is a cute Jack!! This is such an amazing work! It's like a poster or a card game with little Jack as the cover. This perfectly displays his level of happiness. I'm sure Jack would love this! Aww thank you! That really means a lot to me.